The winds of change caressing Buick’s flagship LaCrosse luxury full-size sedan are but a mild breeze so far. The perk-toting 2016 LaCrosse remains a 5-passenger higher-mid-management-oriented commuter car that can be delivered with all trims boasting either standard front-wheel drive (FWD) or available full-time all-wheel drive (AWD). There are, for the upcoming year, some subtle styling tweaks, including 3 new exterior colors, as well as a set of striking new headlights and taillights. Furthermore, expect a new look to the standard 7-inch infotainment display, and the upcoming LaCrosse is also expected to ride on GM’s new Epsilon III underpinnings. Additionally, the once-afterthought entry-level 1SV now gets full-blown trim status and joins the entry-level Base LaCrosse, the appropriately titled Leather, the upscale Premium, and the uber-equipped Premium 2 iteration. And you may recall that each of the various LaCrosse trims are known as Groups in Buick-speak. As for additional changes scheduled for the 2016 LaCrosse lineup, the aforementioned trio of new exterior colors—Dark Sapphire Blue Metallic, Graphite Gray Metallic, and Ebony Twilight Metallic—will replace 4 outgoing hues, while the brand-topping Premium Group trims, often alluded to as Premium and Premium 2, will now be distinguished by a set of reworked 20-inch silver-plated alloy wheels. Unfortunately, there are as yet no indications that the current (and decidedly sub-par) 13.3 cubic feet of trunk space will increase in the upcoming year. A choice of 2 engines returns for the 2016 LaCrosse lineup, with the 2.4-liter eAssist (hybrid) inline 4-cylinder (I4) powerplant still standard in the Base LaCrosse for 2016. Mated with an 11-kilowatt electric motor, a lithium-ion battery pack, and a 6-speed shiftable automatic transmission, this underpowered gas/electric mill puts out a mere 182 hp and 172 lb-ft of torque. Mileage, however, remains this “mild” hybrid’s saving grace, at an estimated 25 mpg city/36 highway/29 combined. All other 2016 LaCrosse variations, now including the FWD Leather Group, are slated to pack the peppy 3.6-liter V6 engine, again mated with the 6-speed shiftable automatic. Look for the return of 304 hp and 264 lb-ft of torque from the V6, with mileage numbers again expected to run 18/28/21 in FWD editions and 17/26/20 in AWD-equipped trims. Techno-goodies, meantime, are expected to include Bluetooth-interfaced OnStar infotainment with the upgraded-for-2016 8-inch display screen, as well as a CD/MP3 player boasting 7 speakers, satellite radio, and an auxiliary audio input in the 1SV, Base, and Leather Group. The Premium variants, meantime, will each once again boast a Bose premium audio setup powering 11 speakers. Few changes of optional features in the 2016 LaCrosse are expected, so look for current upgrades to the leather upholstery and the classy faux-wood cabin accents to remain available next year, as well as a bunch of improved safety features. Speaking of safety, expect the 2016 LaCrosse to again sport standard 4-wheel antilock brakes (ABS), traction and stability control, front and rear side-mounted airbags, and front and rear head airbags. Daytime running lights, a post-collision safety system, and OnStar emergency telematics also remain standard throughout the lineup, as does a remote antitheft alarm. Again for the upcoming model year, the Leather Group and higher trims will also boast standard turn-signal-integrated mirrors. Additionally, optional trim-specific safety equipment, as hinted above, is slated to include front fog/driving lights, high-intensity-discharge headlights, adaptive cruise control, blind-spot monitoring, lane-keeping assistance, and a driver’s “Safety Alert” seat designed to vibrate when unsafe conditions are noted by any of the above monitors. Both the National Highway Safety Transportation Administration (NHTSA) and the Insurance Institute for Highway Safety (IIHS) have given the current LaCrosse their highest ratings for overall safety, and there’s no reason for that to change in the upcoming year. Finally, the gentle breezes of change embracing the 2016 LaCrosse are anticipated to reach hurricane force in 2017, with the LaCrosse lineup scheduled for a total remake from the chassis up. The folks at Buick assure us that this whirlwind will result in a whole new generation of upscale elegance endowing their flagship 4-door. In the meantime, look for the already luxury-laden 2016 LaCrosse sedan to go on sale in the late summer of 2015, when it will renew its rivalry with such full-size 4-door worthies as Chevy’s recently upgraded Impala, Chrysler’s potent 300, Lexus’ well-wrought ES 350, and Hyundai’s Genesis V6. 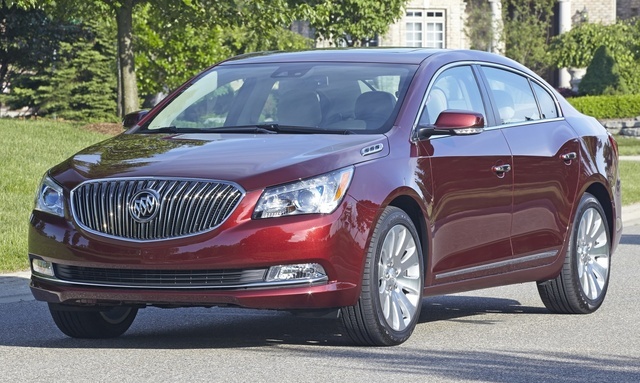 What's your take on the 2016 Buick LaCrosse? 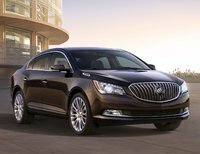 Have you driven a 2016 Buick LaCrosse? How do I turn on the fog lights? I Have A 2016 Buick Lacross And The Battery Went Dead. The tire pressure on the right front was low. It was corrected. But the emergency low tire light will not go off. How do I get this light reset? What does green car on dashboard mean?